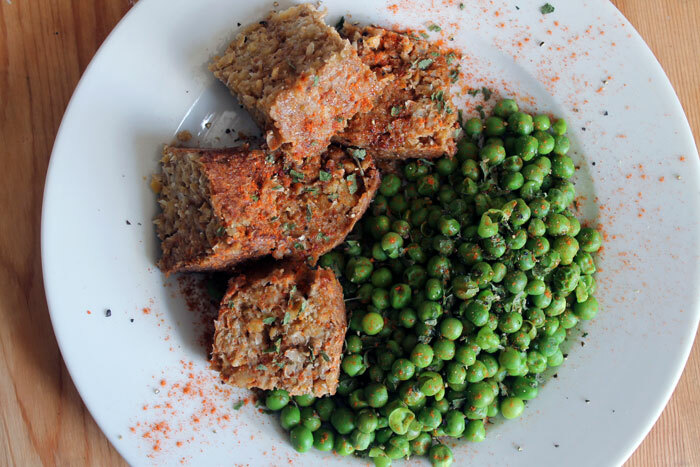 A cheap and healthy protein-rich meal recipe: chickpea paté. Protein is important for high energy levels, preventing water retention, strong immune system and anti-aging. This chickpea paté is a low-carbohydrate, mild-tasting recipe, to which different flavours can be added. It can also easily be enjoyed on its own with some soya sauce. This is one of my staple vegetarian comfort food recipes for when I need a filling and a satisfying meal. If using dried chickpeas, soak them overnight, rinse well, and boil for one hour without salt. Rinse again. Turn the oven on at 175 degrees Celsius (350 degrees Fahrenheit). Puree the chickpeas in a food processor. Puree potatoes, onions and cashew nuts in a food processor. Combine all the ingredients with the eggs and mix well. Grease a glass or a ceramic deep baking tray with butter or non-raw coconut oil. Bake in the oven for one hour at 175 degrees Celsius (350 degrees Fahrenheit). Taste, cut to slices, and add salt or soya sauce before serving as needed. Garnish with olive oil and dried herbs. It is easy to make a larger portion of this paté at once and freeze it for future use. Note that it is usually much cheaper to use dried chickpeas than canned ones. Leave out the cashew nuts and use only two eggs to reduce the cost. Banana can be used instead of eggs to make a vegan version of this dish. You can substitute the chickpeas with other mild-tasting beans if you like, such as butter beans. The taste can be varied by adding different ingredients to taste, such as: lemon juice, tomato puree, fresh herbs, mushrooms or chunks of other vegetables, sherry or white wine, sundried tomatoes, olives, other dried fruits or vegetables (rehydrated first), pesto sauce, chilli sauce, etc. The left-over fiber from making fresh juices can also be added to this recipe, to increase its fibre content. I learned this recipe from my mum, who is a pescatarian, so eats vegetarian foods and fish. She uses it as a staple protein-rich meal and now I do too. I love the taste and the satisfying quality of this meal, and often have it with just green peas (which, by the way, are also protein-rich).